And before people jump on him for spelling, the name appears to be written by whoever got the drawing from him. Those hands weren't made for holding pens, clearly. That's awesome. Must have drawn it whilst wearing his oven mitt. Did Johnny spell his own first name wrong? Dammit Jim I'm a shooter not a drawer! ...ok, but has literally anyone ever been named "Johny"? Johny Hendricks, of the UFC. Former 170lb contender. Shows what all those slashes will do to a guys drawing ability. Haha awesome. Interestingly it is only the third ugliest thing on the jersey after the piping and Alberta flag. Johnny speaks Spanish? Juan Hockey! It looks like Johnny misspells his name in his signature. I only see one N in there. I'm sure both he and his family refer to him as "John." "Johnny" seems to be more a nickname bestowed by teammates. 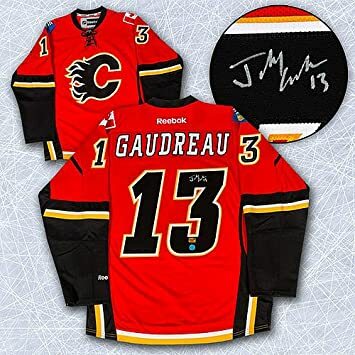 "Johnny Hockey" is a fan thing, obviously.